Have you ever found yourself planning a vacation, or some kind of journey or trip, with a certain set of expectations, only to return with experiences and images you never imagined? Well, that happened to me. For the past two weeks, I’ve been a pilgrim in the Holy Land. I had expected to return refreshed and spiritually renewed after visiting all the sites we read and heard from the Bible. What actually happened was a whirlwind of trips and treks that took me to places that, at first, were confusing and disorienting, with 30 other pilgrims who were having the same experience. We’d get up early dawn, have a quick breakfast, then pile onto our bus to go to all the different places listed in our itineraries. There was so much to see and learn about, but by the end of the trip, most of us had gotten our directional bearings and things began to come together. One of the first misconceptions I had was geographical. 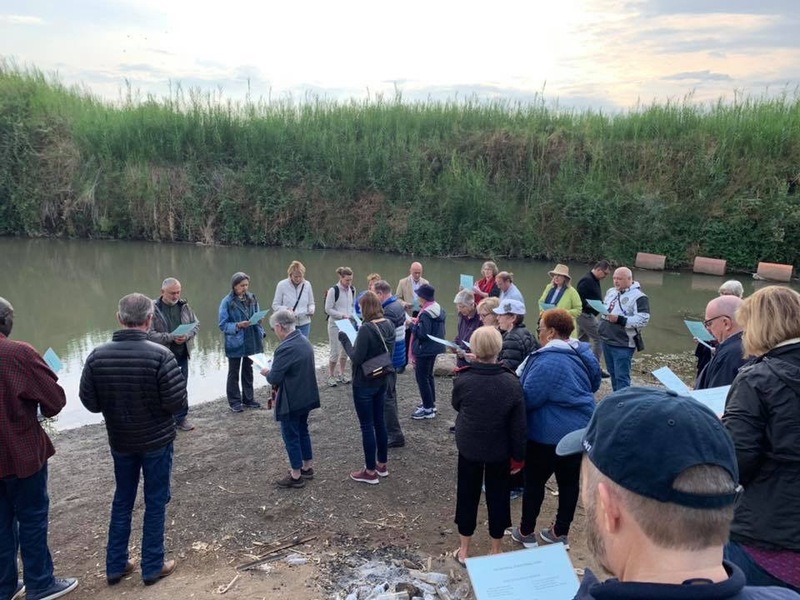 For instance, I had always thought of the Jordan river as a wide expanse with generous sand bars and large rocks, where people gathered to be baptized. Instead we were led to a place that was quiet, marshy and muddy. We renewed our baptismal vows and sang “At the River”. Another surprise was the city of Nazareth, which I believed to be a flat and dusty little town. Not so! Nazareth is atop a collection of hills with amazing vistas and sounds of church bells and chanting Imams. We learned that in Jesus’ time Nazareth had only a population of about 450 people (hence the “little town” impression). 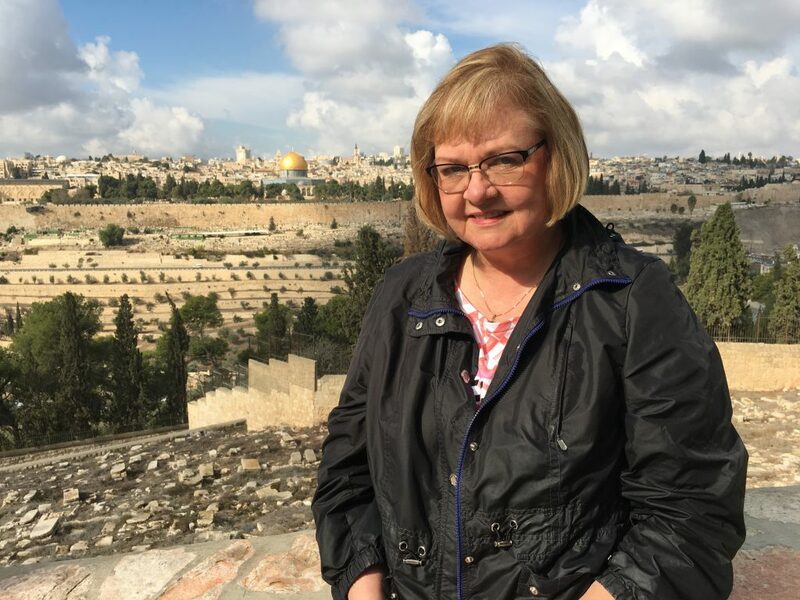 We visited the churches that mark various points of importance in Mary’s and Joseph’s lives, and made our way to the Sea of Galilee and Jericho, among many other sites. All that said, I returned neither refreshed nor spiritually renewed, but instead I am filled with many seeds of images and information that will sprout and grow throughout the year. Last Sunday in church I listened to the Gospel of Mark, “As Jesus came out of the temple, one of his disciples said to him, “Look, Teacher, what large stones and what large buildings!” Then Jesus asked him, “Do you see these great buildings? Not one stone will be left here upon another; all will be thrown down.” When he was sitting on the Mount of Olives opposite the temple, …” hey, I was there, and it happened. Wow. Caption for picture: Lauren at the Mt. of Olives with view of Old Jerusalem. The gold-domed building is the Dome of the Rock, a Muslim temple, in the same location as the Temple in Jesus’ time.